Hopper’s gift was for promoting essential technology. Her campaign was to use computer programs to write computer programs. This is thoroughly accepted today. But when I started programming in the 1970s, people still disputed it. They argued that computers weren’t as good at constructing programs: their programs ran slower and used a lot more storage. Since computers were expensive back then, a lot of people accepted the argument. I accepted the argument. The argument faced greater hurdles in the 1950s. Computers were insanely expensive and hopelessly tiny by today’s standards. It was hard to get them to do anything useful. 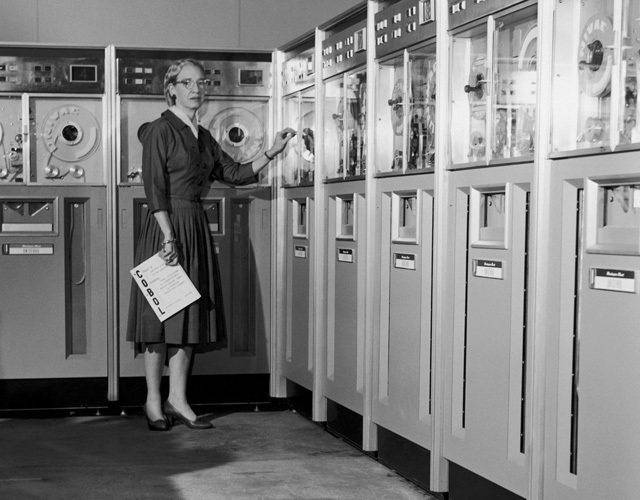 Betty Holberton developed a program called the “Sort Merge Generator,” which would generate a program to manipulate databases stored on magnetic tape. This is often called the “first computer program to write another computer program.” Hopper used this as a starting point to develop program-writing programs called “compilers,” completing A-2, the first commercial compiler, in 1953. IBM developed the Fortran programming language and compiler shortly after that. Under Hopper’s direction, Univac developed a series of programming languages for business applications. In 1959, Hopper approached Saul Gorn in academia and Gene Smith in the US Navy to help her start a new programming initiative: a Common Business Oriented Language, designed to work on any computer, not just Univac or IBM computers. The initial description of COBOL was published by the Department of Defense in 1960. Eventually Hopper returned to active duty in the Navy promote COBOL and other programming technologies. Why the $20 Bill? Why Grace Hopper? Andrew Jackson isn’t a Founding Father of our nation. He did some outstanding things as a military commander and as a politician, but he also had his dark side. His attitude towards non-white residents of the country seems unusually brutal even for his era. Andrew Jackson started the Democratic Party, but not even Democrats think much of him any more. Alex just pointed out to me that the $100 bill has a scientist and inventor on it or, to use modern terms, a technologist. I think another technologist belongs on our money. While I wouldn’t object to the various people proposed by the W2O campaign, just about all of them will yield a political backlash. Hopper should appeal to a broad range of political folks. “Alex just pointed out to me that the $100 bill has a scientist and inventor on it.” The $2 bill does, too.